Take your LionTac Survival Firestarter with you everywhere you go in case of an emergency, fits easily in your pocket, backpack or glove box. Don't get caught in a bad situation without your ferro rod, it's cheap life insurance. ►PREMIUM CONSTRUCTION - A high quality firesteel is used to create spark showers at 5,500 º F, can be used in any weather condition, waterproof, rain proof. Our fire starters are built for the harshest conditions and offer maximum durability. ►UNMATCHED QUALITY We use only best materials, and offer a 100% natural wood that feels great in your hand. You can customize your handle by staining, carving, burning, or just let the oil from you hands give it a custom look. ►THE PERFECT SIZE - It's almost 5" inches long and offers a 1/2" inch thick ferrocium rod, which is good for up to 12,000 strikes. We also include our 6-function multi tool scraper. ►GREAT VALUE - Get more for your money with LionTac Survival. You will be surprised by the quality of the ferro rod at this price. Buy Now and receive LionTac's' 100% Money-Back Guarantee! We are so certain that our Firestarter will put a smile on your face that we offer a no-questions-asked refund policy. For best results, scrape off the black protective coating before use. Keep in mind that we use real wood, so each wood handle for the firesteel is unique and may look a little different from the one pictured. WATERPROOF FERRO ROD- Take your 5" large fire breathing ferro rod with you everywhere and have the confidence that it will work in any weather condition. The provided multi-purpose steel striker is a ruler, bottle opener and hex wrench, oh and it makes sparks too. CAUTION: DELIVERS EXTREMELY HOT SPARKS - This firesteel will deliver up to 20,000 strikes at an amazing 5,500º F to ignite a fire in any weather. Feel confident that your tinder bundle will ignite the night. 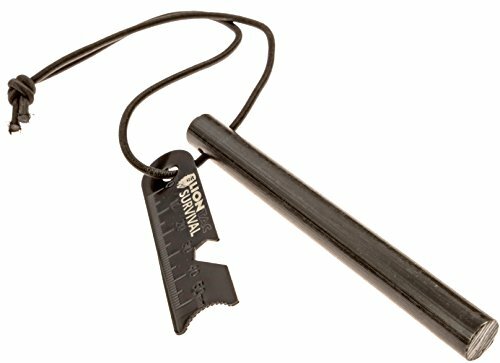 EASY TO USE, A MUST HAVE FOR ANY SURVIVAL SITUATION - Don't leave home without it, the LionTac survival ferro rod should be in your bug out bag, your cars glovebox, or your pant pocket when you leave the house. PREMIUM FERROCERIUM ROD - This premium solid ferro rod is ergonomically designed and provides a great grip to throw a huge spark. Included is a strong elastic shock cord, or replace it with your favorite paracord necklace. NO HASSLE 100% LIFETIME GUARANTEE - If you do not love your LionTac Survival Firestarter, simply return it for a refund. If you have any questions about this product by LionTac, contact us by completing and submitting the form below. If you are looking for a specif part number, please include it with your message.